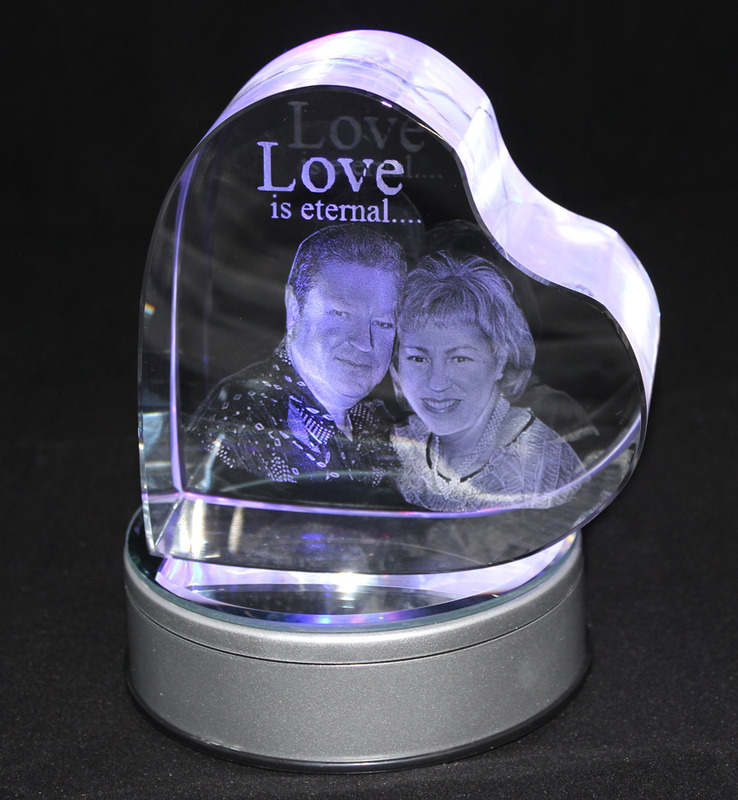 The Galaxy 3D Photo Crystal measures 60x40x40mm. 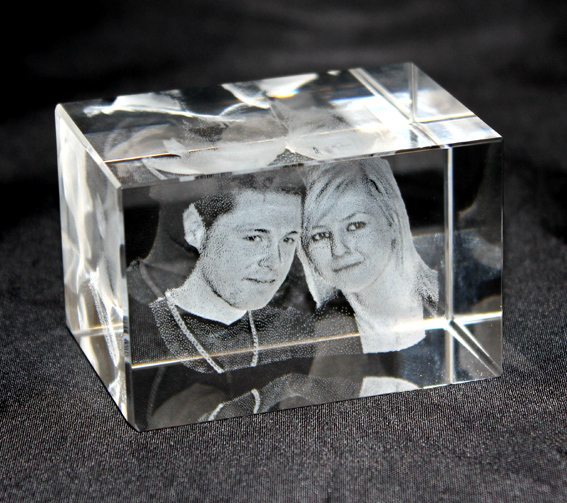 Made from optically perfect crystal we create your 3D conversion from your existing photo and then laser it directly into this beautifully unique item. 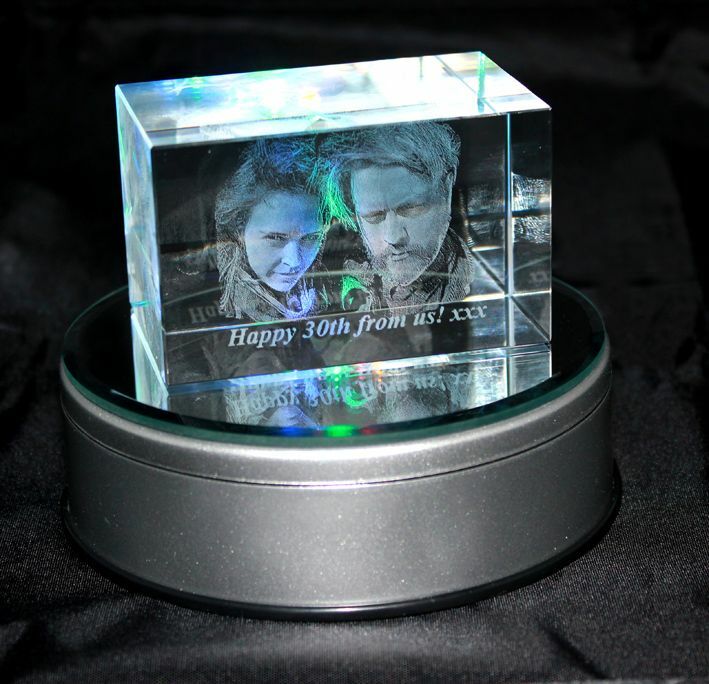 We can also laser a personal message below the 3D photo-we charge £3 for this service (max.25 letters). Enhance your crystal with our Premium Quality rotary 7 LED multi-colour light base with UK power supply available if required at £14.99. 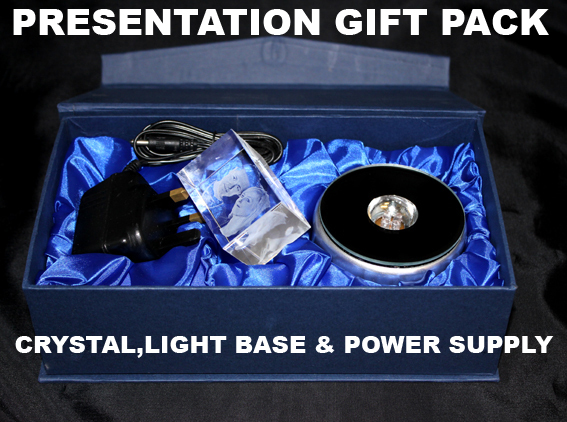 Crystal and light base can also be displayed together in an attractive blue textile lined presentation gift box (£3 extra) otherwise crystal and light base sent together but in seperate boxes. 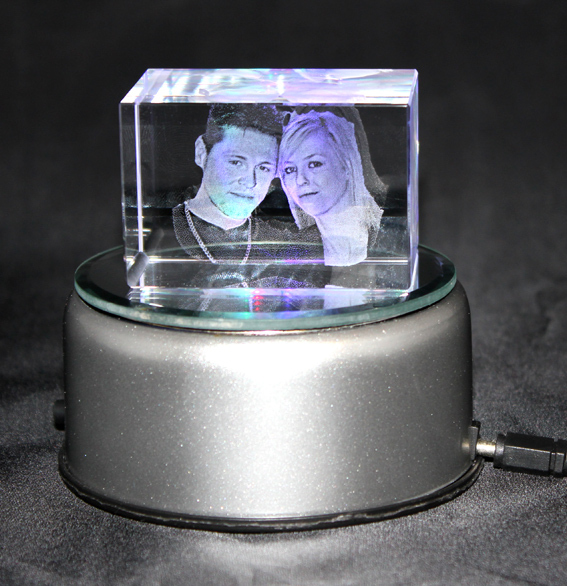 Bulk discounts available on exact replicas of your crystal (same photo and message). I am so happy with my purchase. Cant wait to see mother in laws face on mother's day. Great value for money. Its beautiful!! The photos do not do justice to this product. It is more beautiful in real life. The transfer of the image into the crystal is detailed and delicate. I got the rotating base and it enhances the photo when the block is standing on it. It can be operated by 3 AA batteries and also has a mains outlet point and a plug comes with it. The base can be static and lit up without rotating or you can switch it over to rotate with the lights. As a side note, this was a very time sensitive thing for me as I left it late to order. It was dispatched the same day as ordered and arrived in the morning 2 days later. Outstanding service. Will more than likely be ordering again from this company. Very happy customer. Excellent. ideal for a Christmas present. Had this made for my granddaughters first Christmas. Would really recommend it well packaged. Quick delivery . This is my third Crystal of my granddaughter. Beautifully done and presented. Quick delivery too. Will order again every year til she,s 18. Thank you. Ordered for my in laws for Christmas from an old picture they had that I took quick snap of on my mobile. Super fast delivery and I was over the moon with it when it arrived hope they are on Christmas Day aswell. Very happy with product ordered, arrived with broken plug but was very quickly replaced without question, I can't fault this company and will recommend to anybody wanting this sort of product. Fantastic could no be happier. Got emails keeping me up to date with progress and delivery was super fast too. Looking forward to seeing loved ones faces at Christmas. Will use again in the future. Thanks. Fantastic. All of it fantastic from the crystal photo to the service to the quick turnaround! The 3d photo crystal was amazing, the receiver was extremely happy to have her dog back in 3d and in lights where he always belonged! Thank you, top job! Hi ordered my crytstal photo sunday 25/7 and was delivered on thursday 29/7. great fast service, and the photo crystal was perfect in every way i would recommend this company to anyone and i would defo use it again thanks C.Spencer. Beautifully done and presented crystal of my granddaughter will be ordering again. Thank You. Wow just wow! I have now purchased from here twice, and loved the end product! My family were in awe of the precision and quality. Definitely worth buying as a special gift. Quick delivery too! 5 stars really pleased with end result crystals are excellent, I purchased three as Christmas gifts, excellent communication throughout definitely recommend thank you.